Last week, I wrote about things we recently saw in the north that you would never see in the south. Soooo, this post is about things you will see in the south that will not see above the Mason-Dixon Line. You, my northern and Tennessee friends, are missing out. While the burgers "ain't nuthin' to chaw tobaccy over", their Texas toast is unbelievable! ...in the shade...sort of speaks for itself! I did find grits in a store in Newport, RI, however, they were Quaker Grits, which seem to be sold in most states. If you want true "southern" grits, you have to buy Aunt Jemima! Milo's burgers are the best "fast food" burgers you will ever put in your mouth! Just ask anyone who has had one of these while traveling through the Sweet Home Alabama...because that is the only place you will find this hamburger chain. 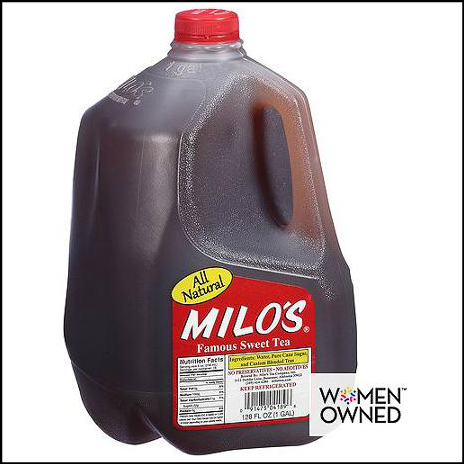 Their sweet tea is well known throughout the south and is truly "all the rage" for sweet tea! There are so many other funky southern things, but I think this will give you a good idea of what goes on down here! LOL...there was quite a bit of trauma on today's blog....LOL. I'm sorry! :-) I can remember drinking sweet tea when I was younger, but when I got older, I just didn't care for it. I was a bit shocked with the question about no ice....bizarre. We also drop peanuts into our bottled coke. YUM!! I still cannot get rid of that song....it is driving me nuts!! LOL...thank you ma'am! Hope you have a great weekend! Hugs!!! I never leave home without my tea. Extra ice, please! 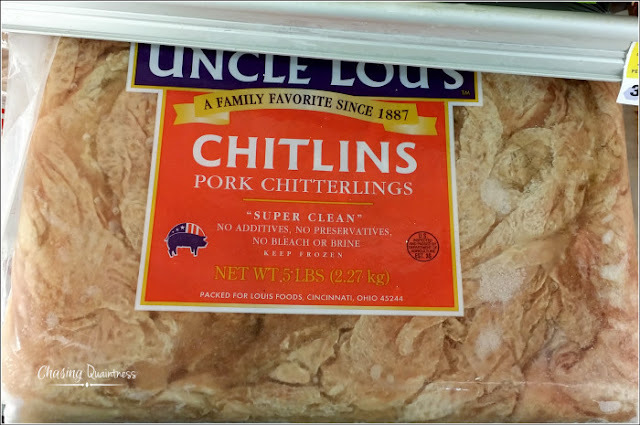 This is the truth, I've never seen pickled pigs feet or chitlins! When I worked in a resort in CA, I always knew who was from the South, they'd always ask if we had 'sweet tea' and when I said No, they just sighed and rolled their eyes! Oh yea, my mother loves "Whata-Burger", I agree their burgers are nothing out of the ordinary, but when I had their Patty Melt on their Texas Toast, Oh my goodness, it was I was hooked. I had no idea it was that hot where you are, Stay cool, lady and have a great weekend! These are staples in the south. 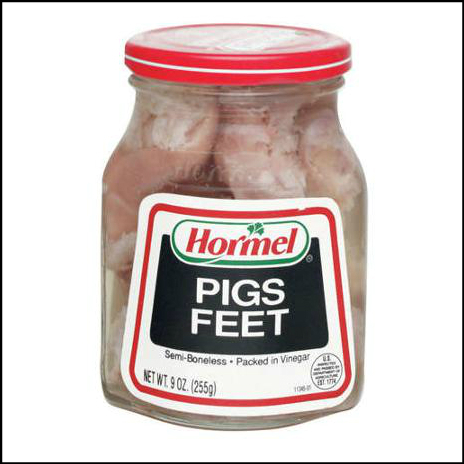 I've never had pig’s feet or chitlins and I don't think they are anything I want to try. I like to stay delusional about the meat I eat and try not to imagine those parts on a live animal...LOL. Sweet tea is a big thing and you can't sweeten it after the fact. I did see that Cracker Barrel provides a simple syrup for sweetening their unsweet tea, which is much better than trying to dissolve sugar in cold tea. 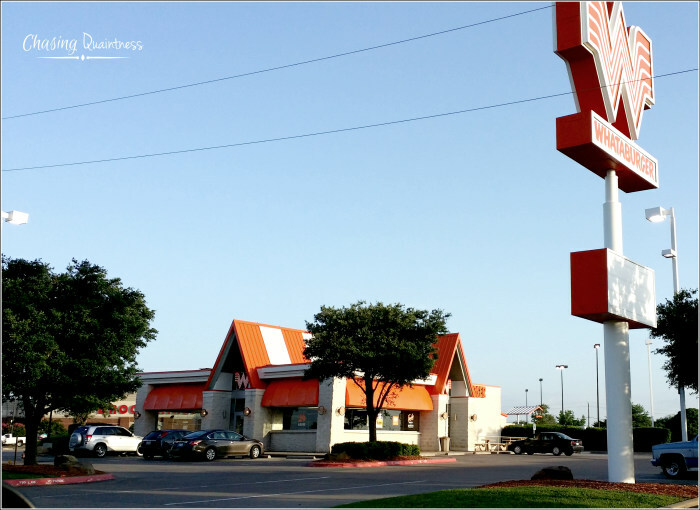 Yep, that Texas Toast gets you every time. The hubster loves the Patty Melt. Nashville is pretty warm...it's been close to 100, but we were in Texas with that temp. You stay cool also and have a wonderful weekend! Hugs!! 107??? Oh, I'd never make it! 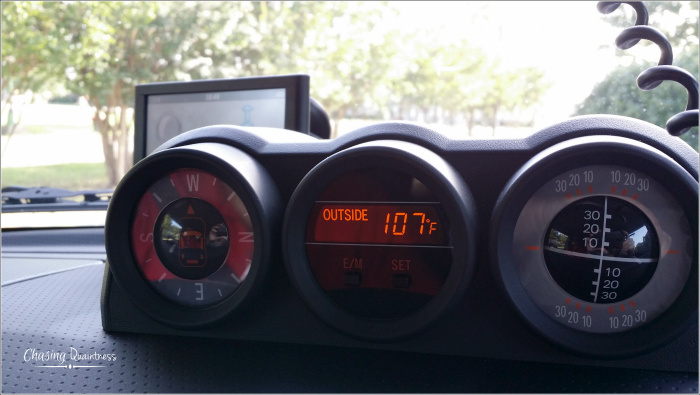 Where's the ac? Good read-I live in CA so most of these things are foreign to me! I confess to eating Quaker grits because they come in a canister, Benita. I've got to switch to Aunt Jemima and try them. We used to buy wonderful grits at Early's stand on the way to Lawrenceburg to visit family. Got our country ham there every December too--how are you about country ham? I don't drink sweet tea either, or unsweetened. Never learned to like it, but my husband drinks it every night of his life! I must get him to try Milo's and that would be one less dirty pot. Has the storm reached y'all yet? It is coming through here so we may lose our electricity at any time. Won't temps in the 80s here be wonderful for a few days after the storm? Better sign off, it is pouring down and winds bending the trees over! Dewena, we have also because we couldn’t find anything else when we lived in Texas. They are not horrible, but not as good as the Aunt Jemima, that’s for sure. 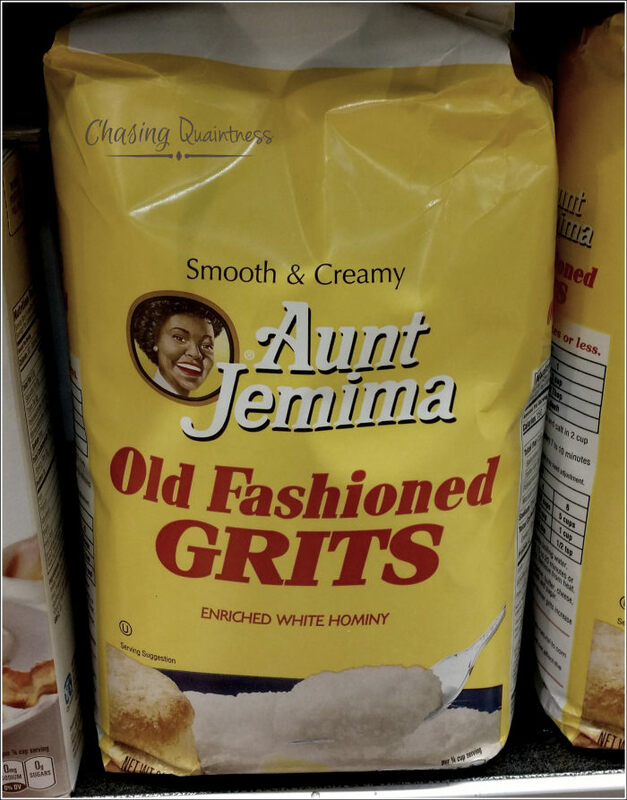 The Quaker grits are a bit more grainy and the Aunt Jemima are creamier. The flavor is pretty much the same. We love some country ham. The hubby loves it on homemade biscuits (which I still make) with some honey. I think your hubby would love the Milo’s tea. Everyone that drinks it becomes addicted. I found out their secret is using brown sugar rather than white sugar. You use less and it flavors the tea better. The cooler temps are the highlight of my week!! :=) I hope things are okay at your house. Take care and please let me know that you guys are safe! Ewww, how did I ever put that stuff in the jar in the first picture in my mouth??!! I wouldn't last a day in the south in that heat.....my hair waves, my bra gets tight and I am just plain miserable! Have never tried true southern grits or sweet tea. Our equivalent of chitlins here in the north, for Italians anyways, is tripe, which is the lining of the cows stomach. Who thought of cooking that stuff??!! I hate sweet tea. When I first moved to Virginia, I asked for plain tea and all I ever heard was, "We don't have plain tea." and "You're not from around here are you?" I think the weirdest thing is the name of things that are different for the same product... Best Foods Mayonnaise here is Hellmann's over there, Carl's Jr. here is called Hardee's over there, etc. The other thing is in California and I've heard in Texas, when we ask for a coke we mean a soda pop, but over there a coke is a coke. LOL….I know you have with living in all of those states. You’ve had a taste of each region! East, West, North and South! Sweet tea is such a deal in the south...and like you, I don't like it at all. And you are right, when you order Coke here, that’s what you want, not Pepsi or RC or anything else. Something I forgot to put on my “southern” list is RC Cola and Moonpies….a really big deal here in the south. In Nolensville, TN and I’m sure in some other places, they have Moonpie festivals. I LOVE these things…lots of sugar and empty calories…LOL. You need to share some of those stories!! :-) Hugs! !